I am thankful for a lifetime of creativity, which I believe to be divinely inspired. Incorporating botanical themes, my work celebrates nature. Elements such as insects, butterflies, vines, and leaves are intertwined with gemstones. Flowers are combined with filigree. Years of drawing and painting laid the foundation for my expression in jewelry. When I first had the opportunity to work with metals in 1974, I knew I had found the medium to translate my visions. As a wearable art form, jewelry is not limited to gallery walls, and can be enjoyed in your everyday experience. I personally design and create all my jewelry. Numerous techniques are incorporated, and I am proud to be involved in the complete process; from wax carving to stone setting. 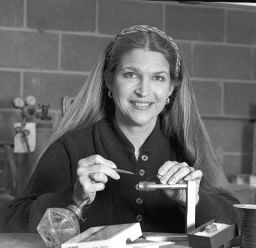 Over 40 years of making custom work has given me the privilege to help others develop their ideas into heirlooms. My goal is to be inspired, and to inspire others.